I enjoyed this one more than I did the previous book, though I did find it a shame we didn’t get more backstory on Shirley. Instead this is just more daily stuff, more about Ms. Bennett. And while that was all fantastic, I did wish we could have found out more about Shirley. She is such an interesting character, full of bravery, full of stuff she still needs to learn, full of intelligence. 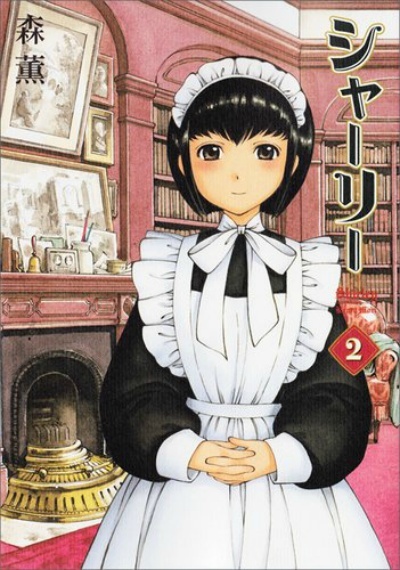 But oh well, at least this whole volume is about Shirley, not like the previous one, in which we had Shirley and 2 other maids. No no, this one is totally about Shirley, or about Ms. Bennett. And I was just delighted at all that, every chapter I kept hoping that we would have more Shirley and Ms. Bennett and then we did! You can just imagine me squealing in happiness. “I loved how mature she was (though I guess that is what happens when one is alone/orphaned in a time like that). At times I thought she was a bit silent, but then she would burst something out and I was just applauding for her bravery. My favourite parts? The storm and the salary. I just had to laugh so hard when all Shirley wanted was new equipment to clean, and didn’t understand why Ms. Bennett would have none of it. Shirley has a lot to learn, like that her salary is really for her, and for her fun only. The art, of course, was gorgeous and I love it. Though at times the eyes were a bit strange (at certain angles, the eyes (pupils and such) looked really huge and alien. After this volume, I can just say one thing, I want more Shirley! And this time about her backstory, because daily life is fun, but I want to know more about Shirley. Would I recommend this one? Yes. Definitely.